Nantes and AS Monaco meet at Stade de la Beaujoire – Louis Fonteneau, in a match for the 1st round of League 1. In this stadium, the history of direct confrontations is favorable to the visiting team, which records 3 wins, 1 draw and 1 loss in the last 5 matches. However, the last time these two teams played a match at this stadium was on 29-11-2017, for League 1, which ended with Nantes leading by (1-0). The only goal of the game was scored by Lucas Lima (90 ‘). In this game the home factor may be decisive, since both teams present considerable differences in the results achieved at home and as a visitor. This is the first match in this edition of the home team competition, which finished the previous edition in the 9th position. This is a team that usually gets better results in away matches than at home, since in the last 30 matches they register 5 wins, 5 draws and 5 losses in away matches, with 22 goals scored and 17 conceded; against 5 wins, 3 draws and 7 losses at their stadium, with 16 goals scored and 18 conceded. In the last match that they disputed, for the Friendlies, they lost with Brighton & Hove Albion away by (2-1). 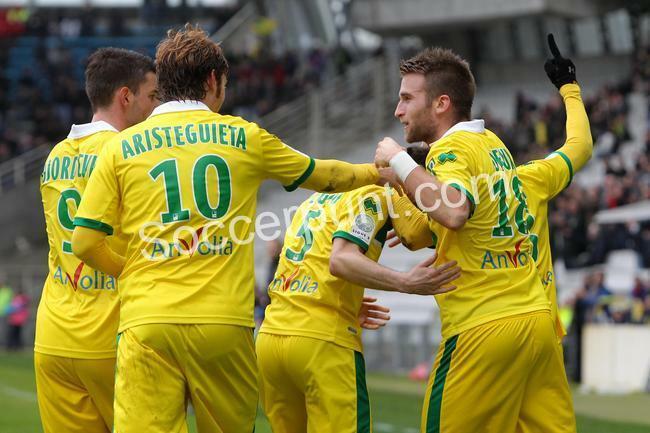 In the last 10 home matches Nantes has won 4, tied 2 and lost 4. Their attack has scored regularly, since they have scored goals in 8 of the last 10 matches. In their away matches there is a tendency for few goals, since 12 of the last 23 matches have ended with Under 1,5 goals and 16 out of 23 ended with Under 2,5 goals. Nantes is a club that has already won eight titles in Ligue 1, the last one in 2000/2001. The club also won three French Cups, plus two Super Cups of France. In the 2017/18 season, Nantes made a regular campaign in Ligue 1, finishing ninth, with one of the worst attacks of the competition. When analyzing all nineteen matches played at home by Ligue 1 in the 2017/18 season, we see that eighteen of these games had less than 3.5 goals. That shows a tendency of Nantes to make games with few goals when acting at home. Now, in this debut against Monaco, he will most likely make a game with a lot of attention and defensive commitment, which will most likely provide a game with few goals. This is the first match in this edition of the competition of the visiting team, which finished the previous edition in the 2nd position. This is a team that usually makes good use of the home advantage, stronger with the help of its supporters, since in the last 30 matches they register 5 wins, 4 draws and 6 losses in away matches, with 26 goals scored and 34 conceded; against 12 wins, 2 draws and 1 loss at their stadium, with 31 goals scored and 14 conceded. The team comes to this match after a defeat away with PSG by (4-0). In the last 10 away matches AS Monaco has won 4, tied 1 and lost 5. Defensive consistency has not been their best feature, as they have conceded goals in 7 of the last 10 matches, but their offense has scored regularly, since he scored goals in 9 of the last 10 matches. In their away matches there is a tendency for goals, since 29 of the last 32 matches have ended with Over 1,5 goals and 23 out of 32 have ended with Over 2,5 goals. The Monaco is a club that has eight titles in Ligue 1, the last one conquered in 2016/17. The club won five French Cups, one Coupe de la Ligue, four Super Cups of France. Monaco finished the 2017/18 Ligue 1 season in the second place, thirteen points behind Paris Saint-Germain. In his away games in Ligue 1 of 2017/18, we see that he oscillated between victories, draws and defeats. In most of his games there were many goals, but when he visited Nantes he lost by 1×0, that is, we see that Monaco has difficulties when visiting Nantes, so we believe that in this first match of Ligue 1 2018/19 we will have a close match and with great difficulties for Monaco.